The Office of Personnel Management’s Inspector General said in a report earlier this month that OPM needs to make improvements in order to meet its strategic plan in processing retirement applications for federal employees. The timely issuance of annuitants’ payments remains a challenge for OPM, especially coordinating retirement benefits between OPM and other agencies for disability benefits and workers compensation. OPM appears to remain focused on its internal process improvements and external outreach towards other Federal agencies to meet their goal. 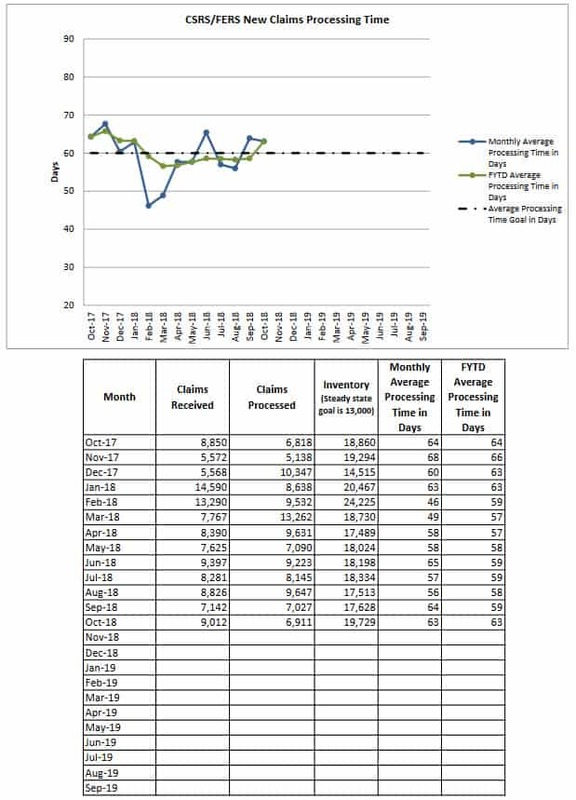 However, while Retirement Services appears to have met its average case processing goal for FY 2018, with an average processing time of 59 days, its claims backlog as of September 2018 was 17,628, more than 4.5 percent higher than at the same time a year ago. In addressing the average call answering time, Retirement Services stated that the average time to answer calls in FY 2017 was 9.7 minutes, but it increased to 12 minutes in FY 2018, more than double the strategic plan goal of 5 minutes or less. Again, no data was provided to support Retirement Services’ average time to answer calls. In order to alleviate the excessive busy signals and long wait times, Retirement Services provided more automated services via Services-On-Line, a redesign which went live on June 10, 2018, featuring a new technology stack with responsive design that is compatible with any hand held device, and provides a more customer friendly experience and efficient processing of transactions. Identify training needs for agencies, develop job aids and on-line training modules, and conduct workshops on the retirement application process. OPM must continue to work to obtain the necessary resources to ensure that the needs of its customers and stakeholders are met. In October, OPM’s backlog of processing retirement applications increased by about 12% reaching over 19,729. The average processing time was 63 days.